Brent D. Stelzer, left, is owner/designer at Brent Douglas Flowers in Eau Claire. 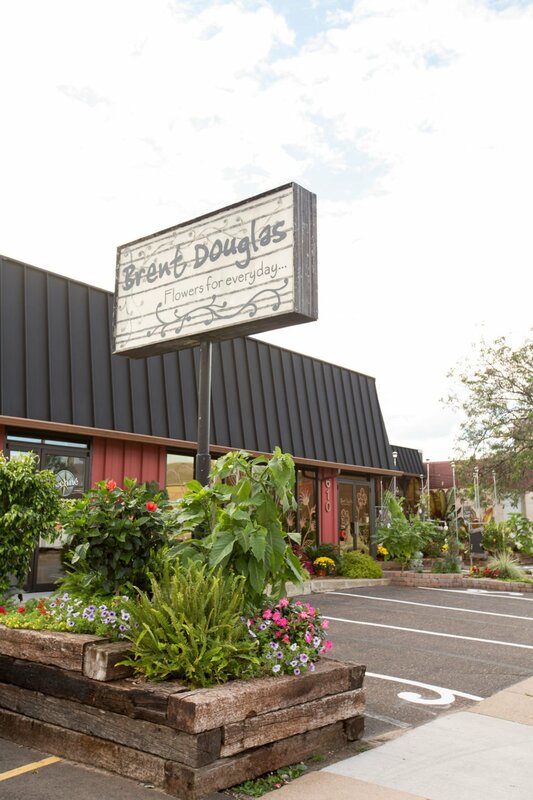 The exterior of Brent Douglas Flowers in Eau Claire. Wedding bouquet arrangements from Avalon European Floral in Eau Claire. Bridal bouquet arrangements by Avalon European Floral in Eau Claire. Wedding floral arrangement by Brent Douglas Flowers in Eau Claire. Centerpiece floral arrangement by Brent Douglas Flowers in Eau Claire. When it comes to intensity of color and complexity of construction, it’s hard to surpass a flower. However, the Chippewa Valley’s florists do just that, when they artfully array these marvels of nature. Then, when they adorn a bride, a church, or a reception hall with floral arrangements, the effect is all the more moving because the medium of petals and leaves is so fleeting. It’s like a Louvre that lasts for a day. However, there are challenges that those outside the business might not consider. There’s Pinterest, the website where brides, photographers, and florists post photos of the ultimate bouquets and wedding arrangements, forcing Valley florists to match the best of the best. The vicissitudes of weather also confound these Valley businesses. Consider moving delicate bouquets in high winds and rain. Additionally, flowers can freeze during winter weddings and wilt during the summer. Plus, more weddings are held outdoors nowadays, forever ratcheting up the challenge of delivering perfect, fleeting flowers. Whereas the flowers are ephemeral, what does linger is the effect the florists have on the Chippewa Valley, enriching our lives with beauty and employing many people. Plus, as wedding parties tend to grow larger, that’s more flowers and more business for the Valley. Wisconsin weather isn’t the only thing that complicates situating the perfect floral arrangement at a Valley wedding. Florida’s and California’s weather are also in play as California is the top producer of flowers, and Miami is a major hub for processing flowers from out of country. When Florida and California can’t deliver, Douglas has to make a quick call. Weddings comprise 15 percent of Douglas’s business, and he dispenses as much data as possible to the impending couple, as couples are increasingly informed consumers. Douglas had done weddings from under a hundred dollars up into the thousands, but averages between $1,000 and $3,000 with centerpieces. However, all that work and all those stems can be undone by a single puff. Weather isn’t the only confounding factor. Emotive insertions can also add time. The popular Pinterest can have a couple pining for flowers that aren’t feasible. This is where a knowledge of flowers can save the day. Too many cooks in the kitchen can also complicate the choices. What can grease the skids are long-standing relationships. Avalon European Floral, like other Valley flower shops, is run like an old-school business. Call them and you won’t have to select one, then two, then one, and then forget what that last question was and have to begin again. People answer their phone, and their customer service just begins there, as a phone call begins by them listening so that they tailor floral arrangements for their customers. That’s especially key for a wedding, where Avalon Floral has arranged flowers from $200 to $25,000. Weddings comprise about 20 percent of Avalon’s business, and it’s a fifth that has considerable challenges. Openings are narrow, as wedding dates don’t change and set-up has to happen the day before or the day of the wedding. However, in the end, whatever the weather, it’s worth it for O’Connell and her staff. Vicki Nelson, the owner of Eevy Ivy Over Flower Shop in Chippewa Falls, also contends with the vagaries of weather and terrain. Over-the-horizon events can also interfere. You might think that once the flowers are in place for the wedding itself, a florist’s work is done, but it doesn’t work that way. Weddings comprise about 10 percent of Eevy Ivy’s business and costs range considerably, depending upon how many comprise the wedding party and whether the party taps into Eevy Ivy’s large assortment of jewelry and gifts, but brides’ bouquets average about $150 and boutonnières cost $10. The cost of centerpieces is largely determined by their size. However, it isn’t weather or terrain that’s Nelson’s biggest concern, but meeting the bride’s expectations. Listening has worked for Nelson, as she’s been in business for nearly a quarter century. Genny Hay, owner and designer at Eau Claire Floral on Brackett Avenue, also hopes that weather will cooperate rather than confound. However, the flowers themselves have to cooperate, which requires impeccable timing. Hay’s reception flowers range from $300 to $3,000, and she also does vase rentals and fresh garlands. Weddings comprise about 15 percent of her business, but it’s a 15 percent she loves. Since weddings are a commencement of a new, shared life, Hay also likes to see what frequently follows. Hay’s repeat business with the couples comes from being frank up front.